Democratic senators put on quite a show Thursday at Supreme Court nominee Brett Kavanaugh's confirmation hearing. Desperate for a "gotcha" moment that would disqualify the Trump nominee, the senators asked pointed questions and gave lectures about transparency. But, they embarrassed themselves in the process. Sen. Cory Booker (NJ) got the loudest laugh. 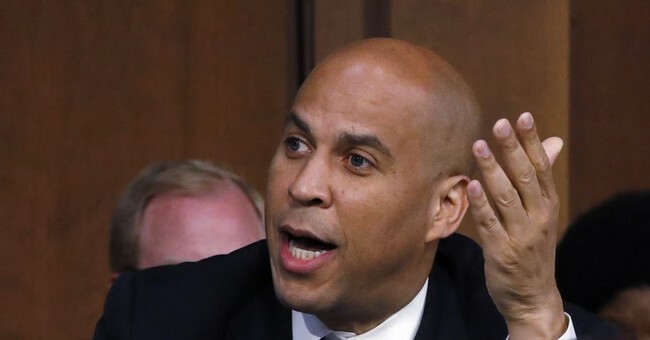 Booker's theatrics came at the very beginning of the hearing. He interrupted Chairman Chuck Grassley's opening remarks to announce that he had broken Senate rules and released "committee confidential" documents about Kavanaugh's opinions on racial profiling. He even referred to himself as "Spartacus," as if he was some kind of martyr. Well, two things. First, it turns out that those "confidential" documents he was talking about had already been cleared for release. Bill Burck, the former Bush administration lawyer overseeing the production of Kavanaugh's documents, said so in an email, adding he was surprised by Booker's histrionics. "Yes, we cleared the documents last night shortly after Senator Booker's staff asked us to," Burck said. "I was surprised to learn about Senator Booker's histrionics this morning because we had already told him he could use the documents publicly." So, his "sacrificial" heroics were all for show. Second, the document in question showed Kavanaugh was against racial profiling. So, just like that, both of his narratives were debunked. Sen. Lindsey Graham (R-SC) reacted to Booker's display Friday morning on Fox News by giving his colleague some friendly advice. "If you're gonna use a document to disqualify a nominee, read it," Graham suggested. "If you read the damn thing," he added, you'll see that Kavanaugh "was against racial profiling." Other Republican senators poked some fun at Booker Friday morning.